Tired of grooming your beards or shaving body hair using traditional methods? With the Babyliss for Men 7420U Super Groomer, you’ll never have to lock yourself for hours in the bathroom with a pair of scissors and tweezers ever again. This electrical appliance takes away the slow and arduous process of cutting and tweezing during your regular grooming sessions and allows you to trim away in a flash. But, apart from speeding up the process of shaving, the Super Groomer has a lot more to offer. This detailed review will explain all that you need to know about the Babyliss for men 7420U beard and body shaver. In terms of features, this is what users can expect from the Babyliss Super Groomer. Cutting blades used in any shaver can make or break the appliance’s effectiveness when it comes to cutting hair. The electrical engineering professionals at Babyliss for men understand this fact perfectly and hence they have powered the Super Groomer with superior electrochemically formed blades. This provides the blades with an ultra-sharp cutting angle to ensure smooth, precise and effortless cutting. When adjusting the cutting length for the blades, all you have to do is turn the adjustment wheel. The 7420U Super Groomer is much more than a beard shaver. This appliance is perfect for full body grooming since it comes with five interchangeable attachment heads. The stubble trimmer provides the option of trimming your beards with a cutting length of between 0.5 to 3 mm. This is the perfect choice for men that want to retain short facial hair. In addition, you can use the detail trimmer to create fine lines along the edges of your beard. When the body comb guide is attached, the Super Groomer shaves body hair with at a cutting length of 0.5 mm. Remove unwanted hair in tiny and hard to reach places with the safe to use nose and ear trimmer. For a clean and smooth finish, make use of the foil shaver attachment head. This kit not only comes with a shaver and several attachment heads, but also has everything you need for personal grooming. Along with the precision shaver and comb guides, each package offers beard and mustache combs to detangle hairs, cleaning brush for removing hairs on the trimmer, and lubrication oil to keep the internal components in perfect working condition. Made from lightweight and hard plastic, the body of this beard and body shaver provides easy handling without compromising on build quality. An additional feature that enhances the ease of use that you will get from this trimmer is the lithium ion rechargeable battery. This means that you can unhook the Super Groomer from its power adaptor and use it away from a mains socket. When fully charged, it can provide up to 80 minutes of cordless use. The only shortcoming of the Babyliss for men 7420U Super Groomer is the lack of a waterproof body. However, this shaver will offer you years of grooming service as long as cleaning and oiling is done regularly and the appliance is kept away from water. The majority buyers who have used this beard and body shaver have given it 4 to 5 stars, with only very few customers reporting of being unhappy with their purchase. 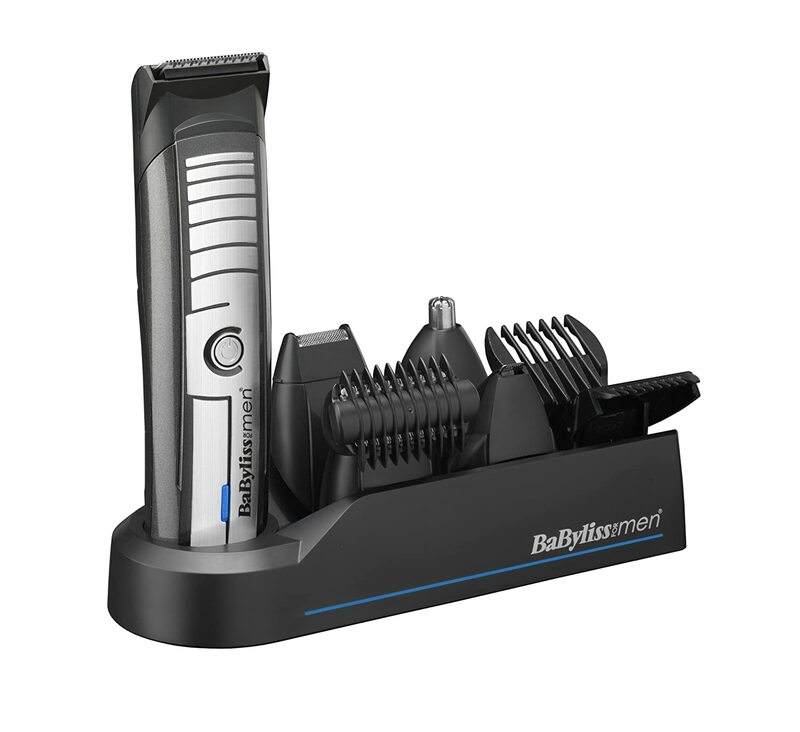 The general consensus amongst users is that the Babyliss for men Super Groomer is an excellent beard and body shaver. The Babyliss for men 7420U all-in-one Super Groomer takes away the need for owning multiple grooming tools thanks to the many roles that it serves. For the price that this appliance is going for, it offers good value for your money when you consider its features, benefits and multiple functions. The best part is that it comes with a warranty, thus allowing you to make a confident purchase.